Tropical Cyclone (TC) Winston was named by RSMC Nadi at 1pm on February 11th, located to the east of Vanuatu. Since then, TC Winston has tracked southeast before turn northeast and is now about to head westerly. Historical track (white) and forecast track (red) of TC Winston up to Saturday 20 February 2016. Image created by MetService on WeatherScape. Winston is expected to intensify to a severe category 5 cyclone. TC Winston was located at 17.0S 170.6W west northwest of the island of Vava’u and northeast of Niue this morning (Thursday 18th February). The central pressure of the cyclone was estimated to be 957 hPa, making it a Category 3 cyclone, and it has started moving in a westward direction and is intensifying rapidly, soon to be a Category 4 cyclone. Winds close to the centre of the cyclone were estimated to be around 157 km/h and strengthening. Over the next 24 hours TC Winston is expected to intensify to a category 5 tropical cyclone. The tropical cyclone is expected to continue to move west southwest direction. 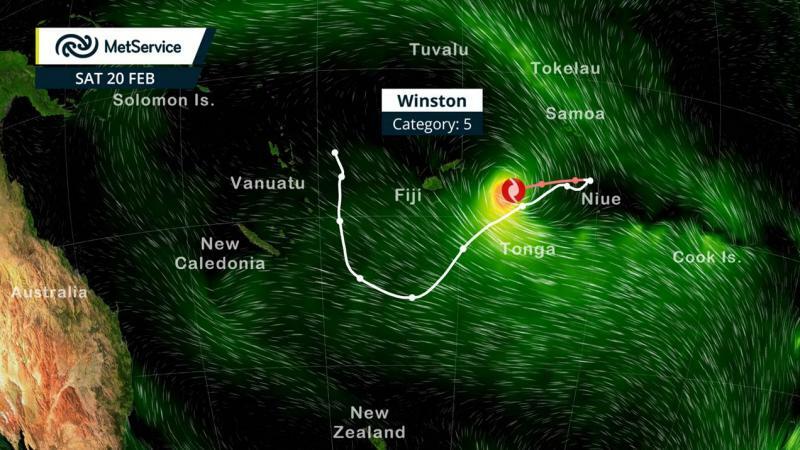 There are currently no direct impacts expected for New Zealand as TC Winston moves westward. In the future there is chance that the track will move southerly, with most tracks to the east of New Zealand. MetService meteorologists are monitoring this tropical cyclone closely and provide tropical updates daily via the Tropical Cyclone Activity page on metservice.com where you can also see hourly satellite imagery.